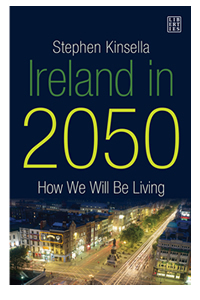 In Ireland in 2050: How We Will Be Living, Stephen Kinsella (Lecturer in Economics at the Kemmy Business School of the University of Limerick) has written what may be the most important Irish book of the decade. Ireland in 2050 touches on a very broad set of subjects, from health, education, energy, employment, global competition, environmental change, technology and wealth and yet it manages to tie all of these to the real lives of people. Kinsella does that by imagining not just a future, but also a future family, the Murphy’s. They experience the best and the worst of the imagined Ireland of 2050 and through them we can see how well or how badly we have adapted to changing circumstances, our successes and our failures. it is a nice device and one, that although I was initially sceptical about, I rather liked. The book is so important not because it is correct in every detail or because the ideas he explores are revolutionary but because by bringing together these thoughts, by projecting them forward and by imagining an approximate Ireland in 2050, Kinsella has set the stage for an almighty row about, who we WANT to be in 40 years time, how we GET there and WHAT values, hopes and dreams are our priority. I wrote it [the book] to start a row. I want to invite you to that row, right now. Do you agree with me that Ireland will be a more unequal place in 2050? Do you see privacy going up in smoke? Do you think that half of the couples in Ireland will be divorced by the middle of the century? Do you see the continual erosion of the Catholic Church as a good or bad thing? What do you think we should be doing to get ourselves ready for the future? The general tone of the book seems to decry the way we have almost sleepwalked into many of the realities of Ireland in 2009. The marginalised young people of outer suburbia, the old-fashioned, poorly equipped health and education services, the lack of local government of any real capacity to effect change and the startling lack of debate about how and in what direction Ireland will develop. It is this core message, the need to make key decisions, to look rationally at the alternatives before us and to choose the “best” option that comes through most forcefully in Kinsella’s writing. When he expresses an opinion ,like arguing Ireland should look West to the USA for its future, while at the same time, not letting go of our relationship with Europe, he is reasonable and sensible. He takes a lomg term view and challenges the blithe assumptions of those who argue the balance of power is shifting east, towards China and India or that Nuclear power is dangerous and unsafe. I sense that he will encounter a fair amount of resistance from the left of Irish politics but at the same time, while he clearly expresses his view, he is often merely describing how changes will impact not how he would like them to impact. His thoughts on the impact of climate change on water supply, agriculture and consumption are scary and yet not alarmist either. Two areas I think he touches on have been so badly covered in the past at least at a mainstream discussion level that he may as well be the first one to mention it, are the changes wrought by divorce and longevity. In many ways these factors are strangely entwined, as humans live longer, they have more relationships, more chances to live parts of their lives as almost completely different people. They may choose to send half their loves with one partner, a quarter with another and still another quarter with a third, our society will be changed beyond all recognition when that is a frequent occurrence. In short with Ireland in 2050: How We Will Be Living, Kinsella has moved the strategic decisions we have avoided taking for the best part of a decade (resulting on the mess we are in now) right into the centre of political and intellectual discussion and is demanding that we figure them out, make a decision and act accordingly. We should all step up to the plate, pay attention, join the row and make sure our voices are heard and that we make the RIGHT decisions. This is a fascinating, accessible and readable book that will hopefully kick off a debate that Ireland really needs to be having and make the decisions we need to make to shape our future at best easier or at worst, better understood. Well worth reading. Ireland in 2050: How We We Will Live is published by Liberties Press is 224 pages and is price €14.99, ISBN: 9781905483693.